In the last few sunny days of August, I took a trip to the Okanagan, which had been ablaze just a few days before with a series of major wildfires. I travelled through Kelowna, West Kelowna and charming Peachland, and got the chance to talk to some of the residents whose lives, communities and health had been affected by the recent fires. In late July of this year, lighting strikes caused seven separate fires in the Okanagan region, requiring 260 firefighters, displacing more than 45,000 people from their homes and placing over 6,000 people on evacuation orders (which means they could have been told to evacuate at a moment’s notice). I went to this region – BC’s wine country, fruit basket, and idyllic summer spot – with hopes of hearing the stories of those in the pathway of BC’s increasingly deadly wildfires. At West Coast, part of my work with the Climate Law in Our Hands initiative is drawing the links between climate change and the impacts that communities in BC are already feeling, and then opening the question of how and who will pay for the inevitable and rising costs of these impacts. As an urbanite who has never had to evacuate my home, I wanted to hear the perspectives of people whose lives had been directly affected. Yes, it is difficult to establish a direct causal link between extreme weather events like the 2018 wildfires and climate change. There are no absolutes in the world of climate change modeling – a science dealing with an increasingly unpredictable future – but climate science is getting better at making those types of links (here’s a study linking the Fort McMurray wildfires to climate change). We do know that global warming is the trickster that can take existing conditions and make them worse. BC’s average temperature is expected to increase by up to 2.7 degrees by 2050, and this year’s heat waves broke several temperature records in the province. The recent report from the UN Intergovernmental Panel on Climate Change (IPCC) made it clear that even half a degree of warming will significantly worsen the risks of drought, floods, and other climate impacts. Increased temperatures create the ideal conditions for wildfires: for example, dead trees from the mountain pine beetle epidemic (itself linked to climate change), a surplus of fuel littered on the forest floor further dried out by the heat, and a significant rise in lightning strikes (which were the cause of all six major Okanagan fires this year). Hotter, drier years are in the forecast for BC’s future. This, combined with a host of other factors, can tell us that fires, floods, and other impacts will get worse as a result of climate change. It would be irresponsible to ignore the implications of this as we plan for the years to come. Burnt hillsides and hazy skies along the highway (Photo: Anjali Appadurai). The 2018 and 2017 wildfire seasons are the worst in BC’s history – and the first time the province has declared a state of emergency related to wildfires two years in a row. In 2017, over a million hectares were burned and over $568 million was spent fighting the fires. The province’s annual wildfire budget is a surprisingly low $63 million. This year’s fires saw a larger area burned (1,349,470 hectares) and a lower cost than last year – but we’ve still spent more than four times the budget, a total of $274 million. The cost to communities was still, of course, devastating. This is, as the report from the province’s Flood and Wildfire Review calls it, the “New Normal”. I began my trip with a visit to Kelowna, where I spoke to Wes Kmet, a long-time resident and active community member. He told me a bit of the history of the area, including how when he first arrived 29 years ago, the Okanagan had the mildest, most pleasant climate he had ever experienced. “Our winters are different now,” he explained, “Everything is more extreme”. I also spoke with Peter Kerr, a retired orchardist who has also lived in the area for many years, and Carol K., another long-time resident. They both lamented how community life had been disrupted by the wildfires and the ensuing smoke. Sporting events were cancelled, public life diminished and their health suffered. I then travelled down the shores of Okanagan Lake to Peachland, driving past miles of blackened hillside where fires had burned right to the edge of the highway. Across the lake, I saw more barren land where the landscape was slowly recovering from major fires in 2003. I stopped to stock up on ripe Okanagan peaches at a little fruit shop off the highway. There I spoke to the owners, who had owned the place for sixty years. They echoed what others in the area had also told me: that while fire crews were working at full capacity, they were unable to respond fully to each fire, partly due to the sheer number of fires, and also because they were unpredictable. The fruit shop owners had not left their family business, instead camping out in the parking lot of the shop and laying their own makeshift fire prevention materials around the perimeter of the property. 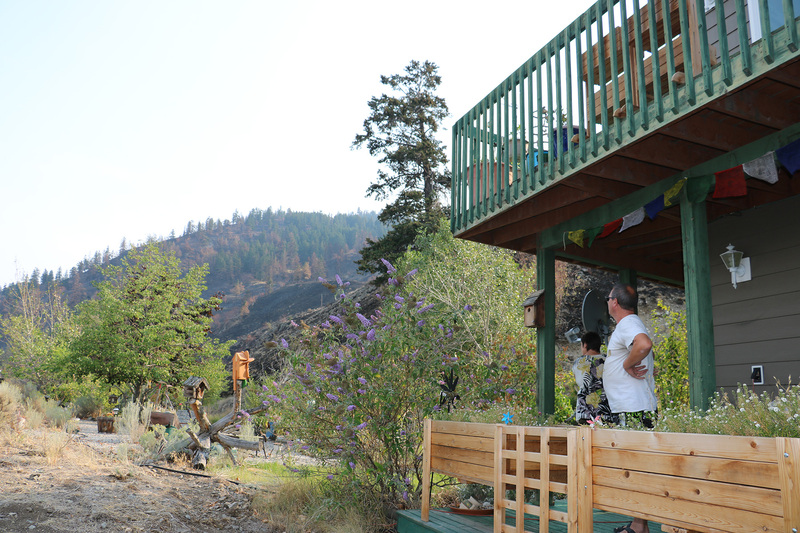 Before reaching Peachland, I stopped to speak with Steve and Debbie Oram, a couple whose home was perched precariously on the hillside, directly in the path of the fires. They were kind enough to give me a tour of their property, which was scorched right up to their front door. Because the fires had suddenly jumped to their hillside, they had been given only one hour to pack their belongings and leave. As we watched a pair of mountain goats descend tentatively to drink from the water bowl they had provided in their front yard (I was in complete awe), Steve and Debbie reflected on how the fire teams in the Okanagan were stretched beyond capacity, and wondered how their municipalities were going to find funds to cope if fires of this magnitude continued to rage each year. “The money being made from oil is just insane, so to expect that [oil companies] should have to pay for the damage they do is no different from holding tobacco companies accountable for people getting cancer,” said Steve, astutely drawing the parallel between Big Tobacco and Big Oil. None of the people I spoke with had any difficulty drawing the connections between the wildfires that had disrupted their communities and climate change. They know that climate change is making this type of catastrophe more likely. Steve minced no words when I asked him the same: “I have no question that we’ve screwed up this world royally”. In my conversations with residents in the Okanagan, I found that they were worried about their municipalities – and by extension, themselves as taxpayers – bearing the increased burden of wildfire costs. My work with Climate Law in Our Hands is intended to open up a new aspect of the conversation around wildfires and climate change: who should pay for the costs, and should fossil fuel companies pay a fair share? We worry sometimes that this last part – recognizing that the fossil fuel economy worsens climate impacts on communities, and that companies should pay a fair share – is too great a leap for some people. But that wasn’t the case for most of the residents I spoke with on this trip. “Fossil fuel corporations – are they going to take some responsibility for what’s happened?” Peter asked as we looked out over the lake on the first smoke-free day after the worst of the fires. He wasn’t alone in his question: I found that most of the people I spoke with were beginning to make the connection between the industry’s role in creating climate change and its responsibility to pay for a fair share of the resulting costs. Just 90 companies have caused – through their products and operations – more than 2/3 of the total human-caused greenhouse gas emissions in the atmosphere. This fossil fuel pollution is wreaking havoc on our climate, weather patterns and oceans, and is making BC’s forest fires worse. Our atmosphere is the battleground of failed multilateral negotiations and the competing interests of profit and people – but I believe that communities have untold power to challenge the fossil fuel industry to take responsibility for some of the costs of their products and actions. If you agree that the fossil fuel industry should be responsible for a fair share of community climate costs, click here to learn more about our Climate Law in our Hands initiative and see how you can get involved. Top photo: Steve and Debbie Oram look out at the hillside near their house, which was impacted by the 2018 wildfires near Peachland, BC.